I have read a number of books by Rachel Carrington and they have all come from different genres. They have all been unique and with each one, Rachel was able to captivate me right up to the final page. 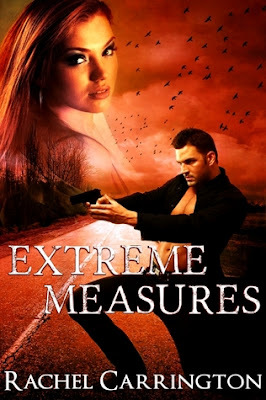 So it is not surprising to know that Rachel enthralled me with Extreme Measures as well. Matt has always loved his ex-wife Erin, even though she divorced him after the murder of her parents by her brother. She has always been in his heart and when her brother escapes prison, he sees it as his duty to protect her. He travels to Erin’s home town to play bodyguard so that he can capture Stuart. Matt is a very noble person and takes his job in the FBI very seriously. Having Erin in front of him dredges up the past and his feelings for her. He will do anything to protect her whether she wants him to or not. Erin pushed Matt away a long time ago and finds it hard to be in his presence again. All of her buried feelings are rising to the surface, the betrayal, loneliness and love. But she doesn’t want him back in her life and does everything she can to keep the distance between them. I think she was more in denial and she is also very stubborn. Matt was the one person in life that she was able to trust and she put the distance between them. Stuart is one cold hearted nemesis and he had my stomach rolling immediately. He has a one track mind and will do anything he can to get to the end game. No one will be able to stop him and he is more than willing to illuminate anyone who stands in his way. I don’t think anyone can talk him out of what he wants and he is just nasty. If Stuart hadn’t escaped I don’t think Matt and Erin would have ever crossed paths again, so it’s lucky for them that he did but also puts them under a lot of stress. They are drawn together under the circumstances and use this time together to re-evaluate their feelings and thoughts. The tension between the two characters is undeniable and I had my fingers crossed that they would be able to do it, without being killed by Stuart in the process. It was a fabulous story and I was on the edge of my seat until the very end!! Another marvellous book Rachel!! Thank you so much for the review! I so appreciate your taking the time to read my book, Naomi! You're welcome Rachel!! I really enjoy your work! !